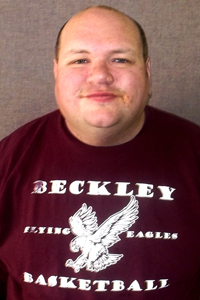 Photo description: Photo of Tommy Darnell wearing his Beckley Flying Eagle basketball shirt. Tommy Darnell is active at Mountain State Centers for Independent Living in Beckley. Tommy also serves as the treasurer for Consumer Advocacy and Advisory Council in Beckley. Tommy actively participates in the disability as a member of the Fair Shake Network and People First. You will also find Tommy at members of the Consumer Advocacy and Advisory Council, Fairshake Network, Friday's in the Park, Beckley Renaissance Events and People First of West Virginia. As a board member, Tommy is looking forward to helping with fundraising for Mountain State Centers for Independent Living.